A wayward invaders-amongst-us comedy, The World's End offers some fun but is hampered by a painful lack of ideas and weak execution. In England, Gary King (Simon Pegg) is solidly in middle age and has wasted his life away. He still reminisces about the college night in Newton Haven when his group of friends attempted an epic pub crawl but only made it through nine of the twelve pubs before quitting. 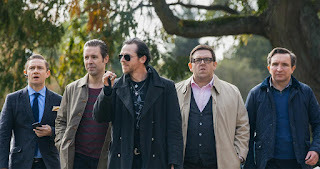 Gary reconnects with Andy (Nick Frost), Steven (Paddy Considine), Oliver (Martin Freeman), and Peter (Eddie Marsan) to convince them to try again and this time make it to all twelve establishments, ending at the appropriately named The World's End. Other than Gary all the men have settled down into various careers and none are thrilled to see him, especially teetotaller Andy, but they humour their old friend mostly out of pity. They start the crawl again and bump into Oliver's sister Sam (Rosamund Pike), who had a quickie in the bathroom with Gary on that fateful college night. But more worrisome is the gentrified new look of the pubs, and the weird behaviour of the locals, soon exposed as robots with dark blue blood. Combining routine middle aged male angst and overly-familiar something-strange-is-going-on-around-here into a comedy bowl, director and co-writer (with Pegg) Edgar Wright tries to wring a good time out of a tired premise. 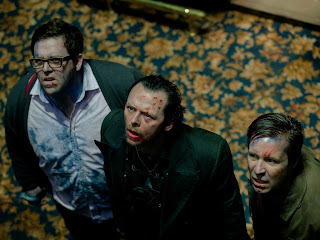 The success is patchy at best, as The World's End desperately searches for meaningful content, overreaching wildly in its climax towards explaining the entire human condition through an argument with a set of lights. Despite plenty of fun to be had in the combat scenes between the easily fragmentable, blue ink spewing robots and the guys, Wright and Pegg falter in building their film on a shallow character base. Gary is a prototypical fast-talking (and mostly lying) drunk loser stuck in the glories of high school, and is not provided with any redeeming character arc. His four friends are generally blank slates, and The World's End trawls within a level of interchangeable disinterest. Rosamund Pike as Sam suffers most of all, and it's not certain anyone knew why she was in the movie. Pierce Brosnan offers a glorified cameo as the college professor who makes an appearance during the second attempt at pub crawl completionism. As for themes Wright and Pegg may be loosely aiming for, choose from the bland freedom-is-all-that-matters to friendship-is-forever hokum, with a pit stop at it's-better-to-be-a-down-and-out-bum-than-a-generic-robot revelation. It's all drowned in repetitive drinking and fighting scenes until the utterly unconvincing finale. The guys are trying to make it to the final pub, but neither the journey nor the destination are worthwhile.